Are you curious to find out what content on social media is trending or was trending at some stage? What about sharing information that is trending on your site with your audience? 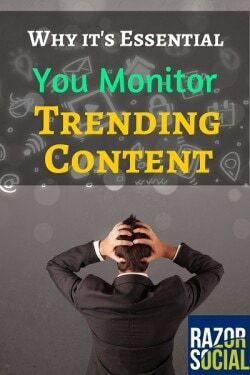 Why is it Essential to Monitor Trending Content? 1. If content is trending and related to your field, this could be good content to share as it’s already proven itself to be popular. 2. If you know what’s trending, this could give you ideas for blog posts you can write. 3. Trending content could be something that is negative about your brand so you might be able to get control of the problem before it escalates. 4. Trending content can help you assess possible future trends so you can look ahead and gauge what may be popular in the future. What Tools Can You Use to Find Trending Content? 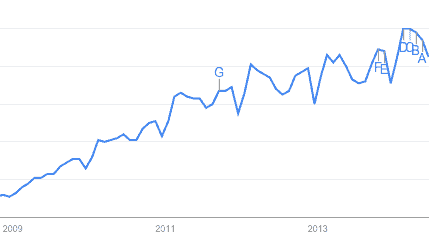 Google Trends shows you trends related to the searches people carry out, and this helps to predict what is coming. If you’re sitting down to write a blog post about a specific topic and you look at Google Trends and see that the searches for this topic are continuously declining, maybe this shows that the topic is not of interest any more. If people are searching for it less and less frequently, maybe it’s either that the topic is not interesting, or that people are using different keywords to search for it. Here’s the trend for social media searches over the last couple of years. Despite some dips the search volume is continuously increasing and this is likely to continue to happen. As well as trends, you can also see other trending searches that are related, for example social marketing and social icons are popular terms that are similar. Google will also try to identify rising searches that could begin trending. Using Google Trends is useful when you are starting out with blogging and you want to understand the current and future popularity of particular topics. When you’re writing content, you may see that the search volume for a particular topic could be low at the moment, but it could be on an upward trend, which means you could possibly get more traffic on an ongoing basis. Trendspottr tries to predict trends before they actually happen. They monitor online activity to see how quickly content is catching fire! There are many signals used but one example is that they monitor how often content is shared in a short period of time, compared to other content in a similar category. In the example below, I’ve set up alerts for ‘social media tools’, ‘Razorsocial’ and ‘social media’. This keeps me informed of popular articles around these areas. When Trendspottr finds an article that is about to trend that is related to my keywords, they will send me an e-mail with a link to the article. It’s important to keep track of trending items in the niche that you operate in. AddThis provides a whole range of social sharing and content recommendation plugins for your website. One of the plugins they provide is a tool that identifies the most shared or clicked content on your site and presents this to users. So, instead of picking out your most popular articles and then constantly updating, you can use this tool to do the job for you. By using this tool, you are automatically picking out the trending content for your audience but you can also see the most popular content yourself. Post Planner is a Facebook management tool with a cool piece of functionality called the Content Discovery Engine. 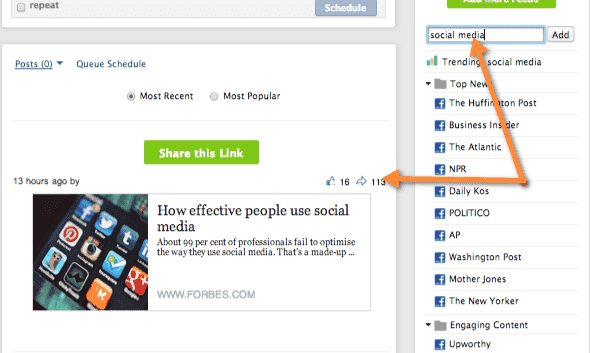 This lets you perform searches for trending content to find content that is worth sharing. If content related to your niche is trending and it’s getting a lot of shares/comments etc., then this could be great content for you to share, too. There are a couple of hundred Facebook Pages set up that you can search to find the most viral photos currently being shared. Some of these pages are also grouped, where pages provide similar content. For example, one folder is ‘awesome quotes’. When you view the contents of this folder, you can view a listing of pictures from a variety of sources that are trending. You can filter based on most recent, most popular or most viral and then you can apply a further date-based filter (e.g. most popular today). 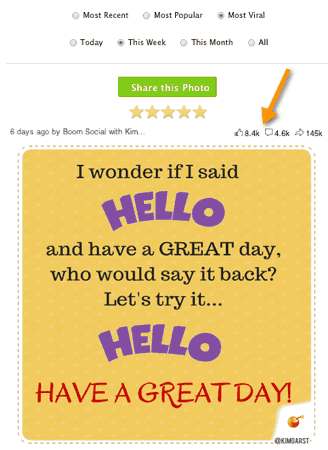 Here’s an example of a post shared by Kim Garst that was extremely popular! This is where you can find trending content based on a keyword search. When you add your keywords, you can indicate if you want to see the most recent or the most popular trending content. Keeping an eye on what’s trending or about to trend is really important. You want to see what is popular content, who are popular authors in your niche and what is going to be popular in the future, while also keeping an eye on what is trending related to your own content. There’s a process and a set of tools for monitoring this. Will you use any of these tools or are there other tools you already use? 1. Read this interesting post on how to find influencers on social media. 2. Comment below, we love to hear from you!